Poor leadership skills, particularly for physicians working in large centres, have a significant association with physician burnout and dissatisfaction, according to a review to appear in the journal Current Problems in Diagnostic Radiology. The study is available online as an accepted manuscript. Physician burnout is associated with outcomes of significant public interest including higher rates of medical error, lapses in professionalism, faculty turnover, and suicidal ideation. Burnout rates among radiologists in 2016 are estimated at 50 percent, with radiologists ranking 10th of 25 surveyed specialities. In the review article, Nicole Restauri, MD, assistant professor of radiology at University of Colorado and co-authors note that often physicians receive insufficient formal training on how to become effective leaders, despite serving in leadership roles. One sign of ineffective and potentially toxic leadership is disinterest in what others have to say and poor flow of information in the workplace. "(It) is clear that poor communication is a primary driver of dissatisfaction. This operates on several levels including ineffective feedback, unclear performance expectations, competing conflict management style and failure to recognise achievements and express gratitude," the authors write. It's important for a healthcare system to invest in the grooming and training of physician leaders in order to effectively address the problem of burnout, the authors emphasise. Part of this investment could include the availability of corporate coaches as part of a leadership onboarding process. Executive coaches may provide critical feedback and tailored skills training personalised to the individual and organisation, the authors say. Another major factor causing physicians to experience burnout is isolation. During the last 20 years, radiology has witnessed rapid advances in technology. While allowing for increased productivity, these changes also serve to isolate the radiologist from the remainder of the healthcare team and may contribute to the high rate of professional burnout among radiologists, the authors note. A previous study found an 82 percent decrease in the in-person consultation rate for general radiography after transition to a PACS system. 2) increase radiologist visibility and participation in team-based multidisciplinary care; and 3) minimise the amount of time physicians spend on non-physician related activities. The study says successfully combatting burnout will require institutional and cultural changes. 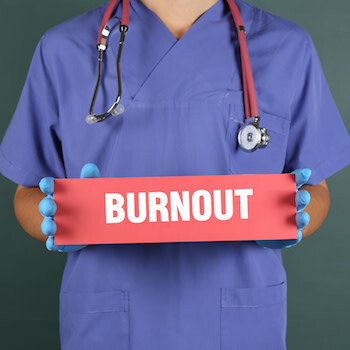 "Addressing this problem necessitates understanding the root causes of burnout while understanding that there will be variation in drivers and symptoms of burnout between individual physicians," the authors write. "Though challenging, addressing these complex causative factors will be necessary to maintain the physician workforce required to provide safe and effective care to our patients." Physician Burnout, Radiologist Wellbeing, leadership skills, physician dissatisfaction Poor leadership skills, particularly for physicians working in large centres, have a significant association with physician burnout and dissatisfaction, according to a review to appear in the journal Current Problems in Diagnostic Radiology.